Whether It's production or performance, allow Diesel to power the progress. Diesel is ideally suited for workbench and work table use in the industrial, institutional and educational industries. This works great as a basic drafting stool. 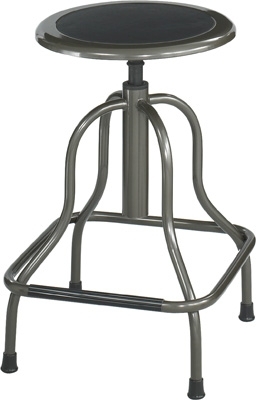 This backless designed stool can be pushed under work surfaces when not in use AND with its steel frame and clear coat Pewter finish, It's built to hold up under rugged use! The nylon coated screw lift manually adjusts the leather padded seat. Durable non-marring rubber feet protect floors. Some assembly required. This drafting stool worked great for our drafting classroom.